We could face a bloodbath. I think that we have a potential of seeing a Watergate-level blowout. — Ted Cruz, telling donors at the Koch-aligned Seminar Network’s 2018 strategy session that Republicans are in huge trouble in the 2018 midterm elections if they don’t ram their agenda through Congress. Can Ben Ray Lujan lead House Democrats to a majority? The Los Angeles Times profiles New Mexico Congressman Ben Ray Lujan, the chair of the Democratic Congressional Campaign Committee (DCCC). In a Senate floor speech on the sixth anniversary of Citizens United, Senator Elizabeth Warren laid out steps that Congress and the Administration can take to root out the influence of money in politics. Four years ago, when radical right wing demagogue Ted Cruz was running for U.S. Senate, he financed his campaign with a large loan from Goldman Sachs — coincidentally his wife’s employer and one of the big Wall Street banks he likes to rail against as being too influential in the nation’s capital. Cruz conveniently failed to disclose the loan at the time he was seeking to replace Kay Bailey Hutchison. The New York Times has more. — Law professor and Democratic presidential candidate Larry Lessig, explaining that he’s pushing forward with his campaign. Lessig had previously pledged to resign from office, if elected, as soon as substantive anti-corruption legislation was enacted by Congress. He has now renounced that pledge after realizing it made his campaign look like a stunt (via The Atlantic). “For the sake of argument, let’s presume that [Tim Eyman sidekick Mike] Fagan – Spokane’s champion of vaccine denial and conservative critic of library story time – was completely, totally unaware of these creative maneuvers. He shouldn’t have been,” writes Spokesman-Review columnist Shawn Vestal. “The state needs to get to the bottom of this, and a wider look at other initiative campaigns Eyman has orchestrated is clearly in order. The AG should go for gusto,” writes The Olympian‘s Brad Shannon. You can call them crazy dreamers, or naive. But I’m rooting for them. It’d be great to call something a “citizens’ initiative” again that doesn’t completely sell out the meaning of the words. — Seattke Times columnist Danny Westneat: Initiative 735 volunteers working to make sure ‘the small potatoes matter’. In politics, money talks. The Washington Post checked to see whether there was any correlation between the Democrats who voted for the CRomnibus bill laden with gifts for Wall Street and K Street. And it turns out that the fifty-seven Democrats who voted “aye” have received twice as much money from Wall Street as the Democrats who voted no on principle. Lincoln didn’t fight the civil war to free the corporations: Thom Hartmann on the origin of “corporate personhood” and the need for Move to Amend (Video from TEDx ConcordiaUPortland, published May 9th, 2014). Politico’s Ken Vogel reports on an internal memo leaked from within the Koch Brothers’ primary front group, Americans For Prosperity, which reveals that the Kochs plan to spend a staggering sum of money ($125 million) to influence the outcome of the 2014 midterm elections. “fair” or “poor”. Particularly unpopular are the Court’s Corporations United and McCutcheon rulings allowing huge sums to be spent to influence elections. Corruption breaks the constitution­ally necessary “chain of communication” between the people and their representatives. It derails the essential speech-to-government-action tie. Where enough money calls the tune, the general public will not be heard. Inso­far as corruption cuts the link between political thought and political action, a free marketplace of political ideas loses its point. That is one reason why the Court has stressed the constitutional importance of Congress’ con­cern that a few large donation snot drown out the voices of the many. — Excerpt from the dissent in McCutcheon v. Federal Elections Commission, authored by Justice Breyer and signed by Justices Sotomayor, Kagan, and Ginsburg. 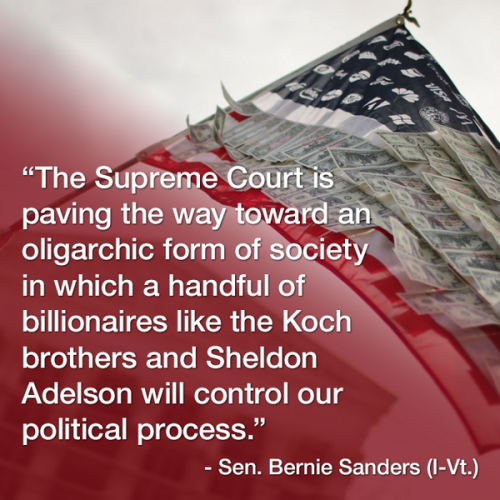 Senator Bernie Sanders: “The Supreme Court is paving the way toward an oligarchic form of society in which a handful of billionaires like the Kock brothers and Sheldon Adelson will control our political process.” (Graphic courtesy of Senator Sanders’ office). Taken together with Citizens United, today’s decision eviscerates our Nation’s campaign finance laws, leaving a remnant incapable of dealing with the grave problems of democratic legitimacy that those laws were intended to resolve.